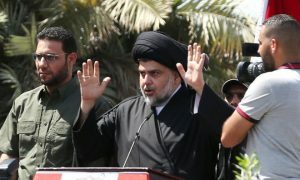 Results of the recount of May pools by the Independent High Election Commission (IHEC) have confirmed Shia and national figure Moqtada al-Sadr’s bloc winner of the disputed electoral process, reports say. The IHEC on its website said Sadr’s joint list has retained its 54 seats of the 329 parliament seats he won during the May 12 elections. Iran-backed Conquest Alliance also has remained runner-up but won more seats while outgoing Prime Minister Haider al-Abadi’s bloc keeps its third place with 42 seats. The commission in June under the parliament instructions began a nationwide manual recount of the ballot after allegations of large scale electoral fraud emerged. The recounts according the electoral body took place in15 provinces of the 18 that make up the Middle East country. The recount which was completed on Monday, was cut short in capital Bagdad over lack of voting records which went in smoke two months ago following the parliament’s decision for recount. Part of A warehouse where ballot-boxes caught fire burning “882 ballot-boxes”, IHEC spokesman, Judge Laith Hamza said. Three police forces and an employee of the electoral commission were arrested in the connection with the arson. After the allegations of fraud were leveled against the IHEC, the legislature replaced all its members by judges. The United Nations on Monday praised the “credible vote recount” while urging political groups to quicken the formation of the government. “We are very pleased that it’s been concluded and we look forward to the next steps in this process towards the formation of the new government,” said a statement by Alice Walpole, a UN envoy to Iraq. Parties can appeal the Friday results before they are sent to Supreme Court for validation. After the court rubber-stamps the results, winning parties have 90 days form the cabinet. Sadr has for moment ruled out becoming the next Prime Minister. He stroke an alliance deal with the Iran-backed bloc and Abadi who wants to keep his position. Also Shia, Abadi is currently leading a caretaker government. Written by: KanelkaTagba on August 10, 2018. Posted by KanelkaTagba on Aug 10 2018. Filed under Headlines, World News. You can follow any responses to this entry through the RSS 2.0. Both comments and pings are currently closed.